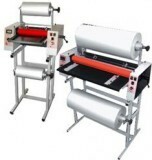 A complete line-up of wide format laminators from 12" to 65" wide. Whether for a school or a professional shop we have a wide format laminator to match your budget and needs. Our wide format laminator selection includes; hot and cold laminating, some with mounting and trimming built-in and models with basic user controls to digitally controlled and programmable. Phoenix™ 44" Pouch laminator is a professional grade mounting laminator that is an easy way to mount and laminate a print.